Despite continuing to improve its performance in some key financial metrics, profitability remains elusive for Brazilian airline Gol, which widened its net losses year-on-year during 3Q2014. The drivers behind Gol’s loss are now quite familiar – a tenuous Brazilian economy, weakened corporate demand and foreign exchange rate volatility. Gol has been battling the majority of those challenges for the last couple of years, and despite improving its leverage ratios and restructuring its debt, the airline continues to rack up losses. Gol continues to drive forward in its network diversification to reduce exposure to the domestic market while awaiting the outcome of vote by Brazilian legislators on an initiative to subsidise regional flights within the country. Gol’s 3Q2014 loss expanded 24% year-on-year to BRL245 million (USD95 million) largely driven by a 10% appreciation of the USD against the BRL. The company has stated that for the next three months it has total hedges in foreign exchange protection of roughly 65% and 27% for the next six months. The airline’s net revenue increased 10% year-on-year to BRL2.5 billion (USD975 million) as passenger unit revenues increased 9.4%. The rise in unit revenue was purely driven by a 8ppt increase in domestic load factor to 78% as domestic supply within Brazil remains in a rational state. 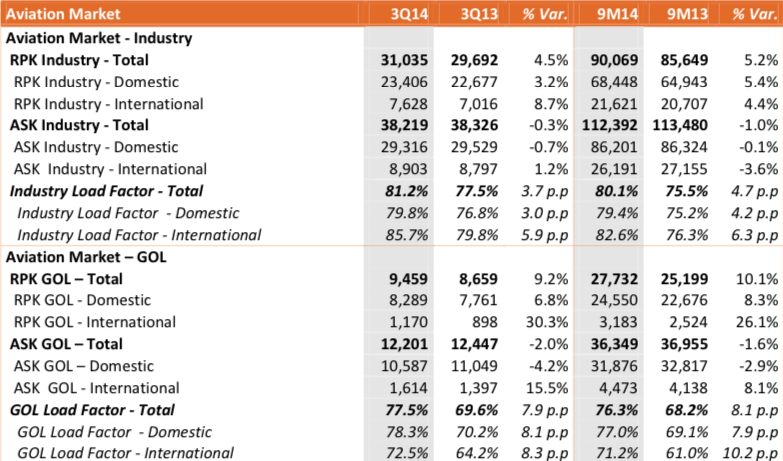 Gol estimates industry supply fell 0.7% year-on-year during 3Q2014 while traffic increased 3%. Gol’s domestic supply dropped 4% during the quarter, and its traffic increased nearly 7%. But much of Gol’s traffic growth was in the leisure sector as yields fell 2% year-on-year due to soft corporate demand that was driven by Brazil’s weaker economy. Gol projects GDP growth in Brazil of 1.5% to 2% in CY2014. Gol executives also believe some of the tepid demand among business travellers is being driven by lingering effects from the 2014 FIFA World Cup soccer tournament hosted by Brazil in Jun-2014 and Jul-2014. The company’s management indicated that corporate bookings might start to rebound near the end of 2014 as the busy high travel season gets underway. Previously, Gol has highlighted a push to enlarge its corporate traveller base, and estimated that between 1H2012 and 1H2014 its market share among business passengers on domestic flights grew from 30% to 31%. The company has also estimated that higher yielding passengers can draw four to six times more revenue than non-corporate travellers. Gol’s international capacity increased 15.5% year-on-year during 3Q2014 and traffic grew by 30%. Its load factor on those routes climbed 8.3ppt year-on-year to 72.5%. Part of Gol’s push is a stop-over in Santo Domingo, Dominican Republic on US services from Sao Paulo and Rio de Janeiro to Miami and Orlando. In Jul-2014 Gol introduced flights from Campinas Viracopos to Miami and Orlando via Santo Domingo while reducing capacity from Rio de Janeiro to Santo Domingo. New service has also been added from Sao Paulo to Punta Cana. Gol from 7-Dec-2014 to 22-Feb-2015 is adding a Punta Cana-Orlando leg to the Sao Paulo-Punta Cana flight in what seems to be a move to leverage high season traffic. Gol’s recorded BRL311 million (USD122 million) in international passenger revenue in 3Q2014, which was roughly 13% of total revenue. The airline has a stated goal of international routes representing about 17% of total revenues by 2016. Its international performance during 3Q2014 was also bolstered by partnership revenue, which increased 54% year-on-year. At the end of 3Q2014 Gol had nine codesharing partnerships and 78 interline agreements. Gol has battled unit cost pressure for most of CY2014 and 3Q2014 was no different. Its unit costs excluding fuel in the quarter increased 9.8% year-on-year and 21% for the first nine months of the year. An increase in salaries, aircraft rent, sales and marketing and other expenses are the main drivers of the cost pressure, and Gol expects unit costs excluding fuel to grow 10% or higher for CY2014. One of the drivers of the cost inflation is Gol's leasing expense is denominated in USD. Even though unit revenues increased 18.4% for the first nine months of 2014 and yields grew by 5.8%, Gol’s projected cost headwinds are obviously not an ideal scenario. One of Gol’s initiatives during the last three years is to improve its leverage by restructuring some of its debt. Between 3Q2013 and 3Q2014 its ratio of gross debt to the trailing 12 months EBITAR fell from 10.9x to 6.3x. Its cash position as a percentage of trailing 12 months revenue was 27%, which was 2ppt above its target of 25%. Although Gol has made good progress in lowering its leverage ratios, some of the interest rates on its debt remains high. During 3Q2014 the average maturity of its long-term debt of BRL4.8 billion (USD1.9 billion) was 4.7 years (excluding aircraft leasing, non-maturing debt and debentures of the Smiles loyalty programme). The rate for local currency debt is 11.4% and 7.9% for USD denominated debt. One wildcard for Gol and all Brazilian airlines is a regional aviation plan making its way through Congress that would grant subsidies on smaller, less profitable routes. News outlet Reuters reported on 11-Nov-2014 that a provision will remain in the legislation that caps the subsidies at 60 seats. Previously, Reuters highlighted Brazil’s Azul had warned that, if a change inserted into the bill removing the cap remained in place, its order for 30 Brazilian made Embraer 195 E2 jets could be in jeopardy. During Sep-2014 Gol issued a statement explaining it was evaluating the E2 jets for possible delivery in 2018. It explained that it was examining the aircraft for less dense routes. It seems that Gol is accessing both Embraer and Boeing jets to replace its 144-seat Boeing 737-700s. CAPA’s Fleet Database shows that Gol has 27 of the -700s in operation. Gol is an all-737 operator, with the backbone of its fleet comprising 737-800s. An order for EJets would be a huge win for Embraer, but also create unnecessary fleet complexity for Gol as it works to reverse years-long annual losses. Gol recently estimated that it could net USD20 million in subsidies from the government programme, which according to Reuters would total BRL500 million (USD185 million) annually. It is not clear if the legislation will ultimately pass, so obviously Gol is likely not including any subsidy benefit into its forward planning. Gol can be credited for making great strides in working to improve its leverage, diversify its network and being a first mover to rein in capacity within the Brazilian domestic market. 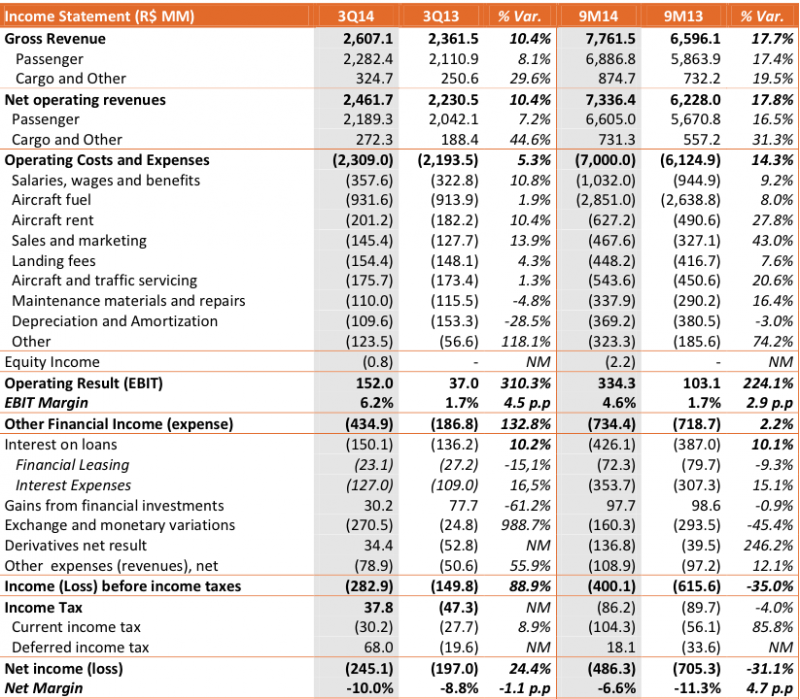 At one point Gol stressed that CY2014 was the year it reached altitude on its flight path to restoring profitability, and has said it could achieve a positive net income when its margins reach the high single digits, which might occur by YE2015. Gol did improve its losses for the 9M ending 3Q2014 by 31% to BRL486 million (USD189 million). But foreign exchange volatility and inflation rates in Brazil projected at 6% in CY2015, may force Gol may have to further refine its target date of regaining profitability. Despite some recent recognition from Wall Street for its efforts in strengthening its balance sheet, profitability could remain elusive for Gol for the foreseeable future.